In cycling parlance, a century is "a bicycle ride of 100 miles or more within 12 hours.". 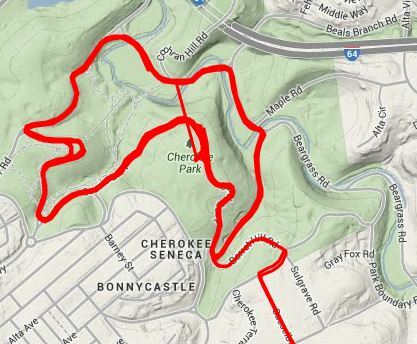 This past Saturday, I did my first one in Louisville's Cherokee Park Scenic Loop. The Scenic Loop is a closed, ~2.4mi, one-way loop open to cars, pedestrians, and cyclists. I rode around it 43 times. It took 7 hours and 30 minutes. This is how it happened. It's Saturday, the last day that Jane and the kids are gone and I'm on my own. I wake up at 8:15 and eat a giant bowl of grapenuts, raisins, chia seeds, and almond milk. I pack my jacket with 2 Powerbars, 4 energy gels, 4 fruit gels and two 24oz water bottles. I put on comfortable socks, my favorite pair of bike shorts, thin long fingered gloves. It's right around 40F so I don't wear shoe covers or tights. I make sure I have my mini-pump, a tube, tire levers. I put on my helmet, pump up my tires one last time and roll out. The absurdity of what I'm about to try hits me as I reach the top of Barrett Hill. Then I drop down into the park and I forget about everything. The air is cool and clear. My bike is tuned and pedaling is effortless. There are people running and walking, an older crowd. The young people are still sleeping and it's too cold for the people with little kids. I'm feeling good. Strong. Lots of energy. I force myself to slow down going up Dog Hill. The wind feels amazing on my face as I fly down the other side. I take my time going up the hill to Hogan's fountain. And then my first lap is done. There's a twinge when I start to think about how many more times I'm going to do this but I push it away and start on the second lap. I try not to look at my Garmin too often. Just concentrate on pedaling, watching the people around me. And before I know it, I've gone 30 miles. The kids have my headphones so I don't have any music. I've been counting my laps as a way to pass the time. A little over 3 hours has gone by and I'm coming up on 20 laps, the furthest I've ridden in the park before. Then 20 passes and so does 21 and I'm in uncharted territory. I celebrate 50 miles by stopping at the picnic tables near the fountain. I eat a fruit gel and a Powerbar. I drain both of my water bottles and refill them. And then I'm riding again. I pass 60 miles and it's the farthest I've ever ridden anywhere. At lap 28, I start making up rhymes for each lap number. 28, feeling great. 29, feeling fine. 30 is a difficult rhyme. At 75 miles, I get off the bike again and eat my second Powerbar. My legs are feeling stiff but no cramps. I drink as much water as I can stand and stretch. And then I'm riding again. Riding and riding and riding. My body forgets what it's like to do anything but pedal. I see the same groups of people over and over for 30, 40, 60 minutes. They disappear and new people replace them. I'm getting hungry but I only have the one fruit gel left and I decide to save it for mile 85. I wish I'd brought a third Powerbar. Then I look at my Garmin, at the numbers 8-0 and I laugh out loud. I laugh because it's the biggest number I've ever seen. I hit 85 miles, eat my last snack and buckle down to finish this thing. I'm so close I can taste it. I hit 90 miles, then 95 miles and it's all a blur. I've lost all concept of time. My watch says I've been doing this for over 7 hours but it could have been 30 minutes. Or a week. I'm feeling giddy. And in no time at all, it ticks over to 100. I ride up the last hill and head home. 103.5 miles, 7 hours and 30 minutes, it's done.